The pattern calls for there to be 2 plain rounds after the last pair of charted/plain (making it 3 plain rounds before the bind off)... 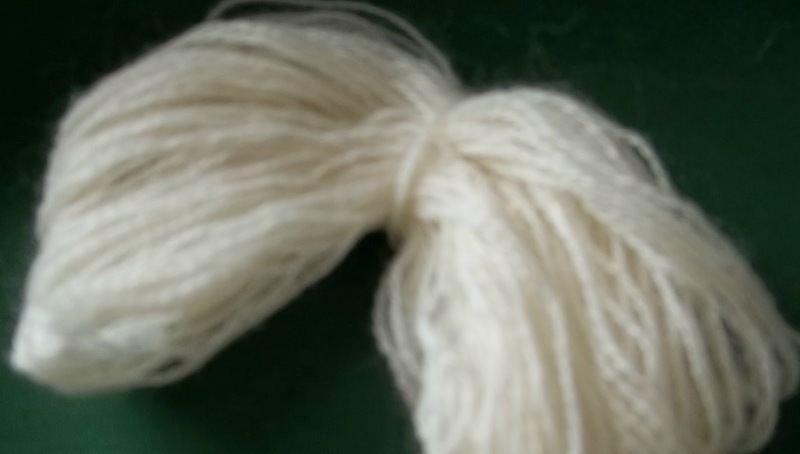 But I am worried I don't have enough yarn for another plain--(the first of the 2 called for!) I am positive I don't have enough yarn for 2 rounds! The circumference equals the diameter (60) X Pi--(3.14) OK so lets round Pi down to 3. 3 X 60 is 180 inches of diameter--that's 5 yards! 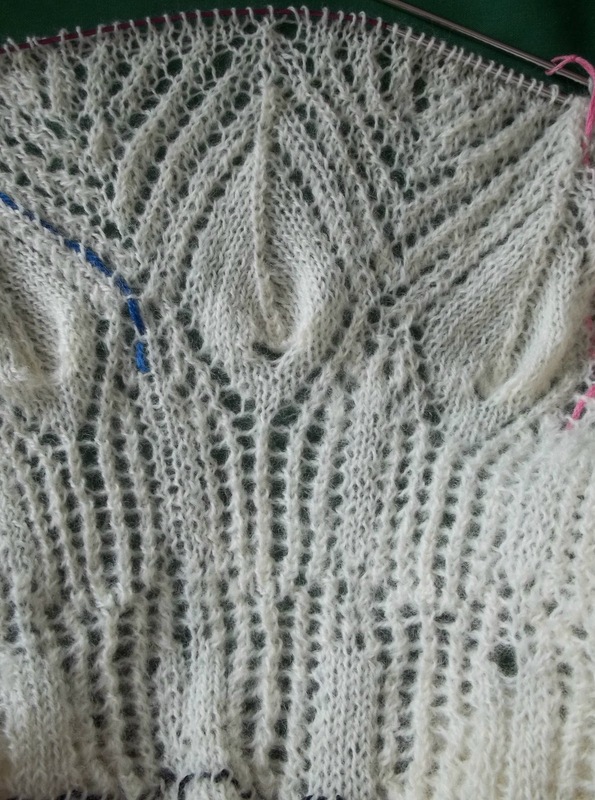 The bind off needs at least 4 times that—or at least 20 yards. But I want a really loose bind off. An extra 10 yards is really not very much. 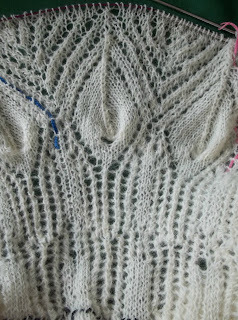 So planning 30 yards for the bind off is OK—generous, but really not excessively so. With the 30 yards reeled off— (and made into a butterfly)--look at what is left of the skein—Nothing! Well, virtually nothing! 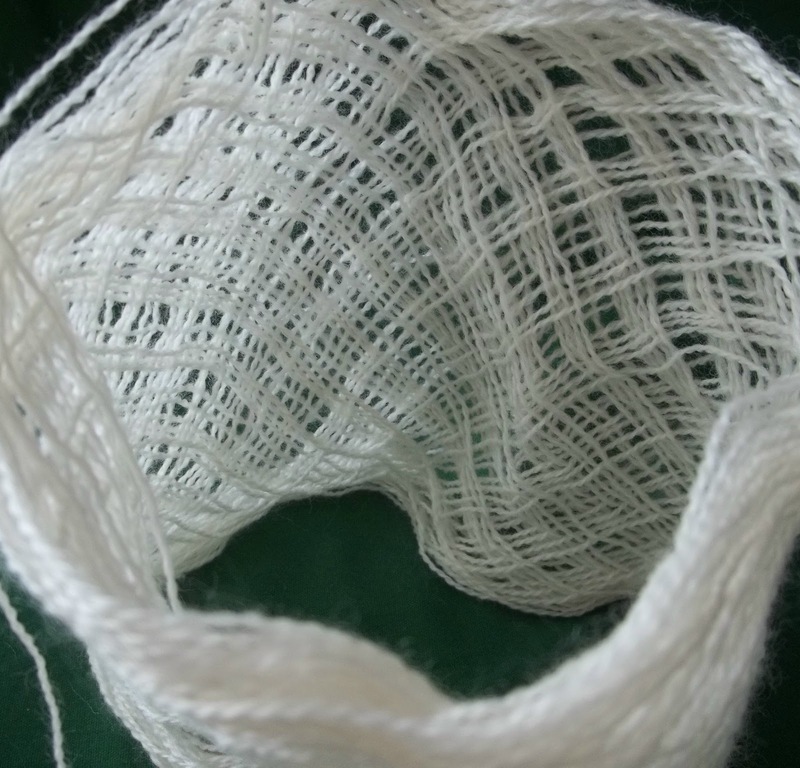 A single round will need –well I am going to measure out 10 yards—and see how much of the round I get knit. 10 yards should take me at least to the half way point of the round. I could be wrong with my math—and I would rather know it sooner, than later! I think 16 yards (which is a bit more than 3 times the diameter--AND my usual approximation of yarn needed for a row/round) is enough for another single round.. I also think that, even if I am wrong, and it is not, I will still have enough yarn left in the ball to complete the round. But I do want to have a clue! I don't want to run out of yarn with just a few stitches left to bind off. If I am wrong--well I might start the bind off at the half way point- and it is clear I don't have enough yarn to finish the round--Well -½ of the shawl will have 2 plain rounds before bind off, and the other half of the shawl will just have a single round of plain knitting before the bind off. It looks like I am going to use almost every inch the 2250 yards in the skein! Lost and Found sock is getting a heel flap—a good 20 rows completed—another dozen or so to go—The socks have 64 stitches—and 32 is just about the right number of rows. Stripe socks have been untouched this week end. As always, your math skills impress! And so practical...who knew? Also, as a spinner, the very idea of spinning 2250 yds of lace weight yarn for a single project is awe-inspiring and a little horrifying. I guess there is a time and place for commercially spun yarn! I've woken up to Tuesday and so excited to see if you have enough yarn. But what about the test piece for the painting process?